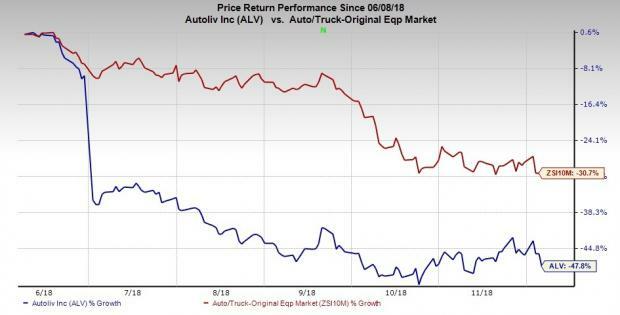 Autoliv, Inc. ALV has announced that it is setting aside $210 million (165 million pounds) in the fourth quarter of 2018 as a cover for the possible fine to be imposed by the European Commission (EC), per Reuters. This Stockholm, Sweden-based auto safety equipment manufacturer believes that the EC is likely to enforce a fine, pertaining to the long-running cartel investigation. The company has been under investigation since 2011 due to the allegation of anti-competitive behavior among suppliers of occupant safety systems in the European Union. In first-quarter 2018, the company had to pay a penalty of 8.1 million euro in relation to a smaller part of the investigation. Some other companies, which also faced penalties in the same investigation, were Toyoda Gosei, Takata, Marutaka and Tokai Rika. Management of Autoliv now believes that the EC will seek to impose a fine in connection with the remaining portion of the investigation. The outcome of the investigation is likely to adversely affect Autoliv’s operating results. Over the past six months, shares of Autoliv have underperformed the industry it belongs to. Over this time frame, shares of the company have plunged 47.8%, whereas the industry decreased 30.7%. Currently, Autoliv carries a Zacks Rank #5 (Strong Sell). A few better-ranked stocks in the auto space are Allison Transmission Holdings, Inc. ALSN, Fox Factory Holding Corp. FOXF and America’s Car-Mart, Inc. CRMT. While Allison Transmission and Fox Factory sport a Zacks Rank #1 (Strong Buy), America’s Car-Mart carries a Zacks Rank #2 (Buy). You can see the complete list of today’s Zacks #1 Rank stocks here. Allison Transmission has an expected long-term growth rate of 10%. Over the past six months, shares of the company have increased 8.3%. Fox Factory has an expected long-term growth rate of 17.9%. Over the past six months, shares of the company have risen 51.8%. America’s Car-Mart has an expected long-term growth rate of 19.5%. Over the past six months, shares of the company have risengrown 11%.